Archaeological excavations have proven that the heart of Florence has been in the same spot for thousands of years – underneath the famous Palazzo Vecchio, itself built in 1299. The excavations unearthed the ruins of an ancient Roman amphitheater in Florence, extending to nearby Piazza della Signoria, where archaeologists have found objects dating to the ancient Roman city of Florentia from 30 to 15 B.C. Archaeologists believe the theater was in use from the first or second century A.D. to the fifth century A.D. Though still an active archaeological site, the ruins are open to the public. 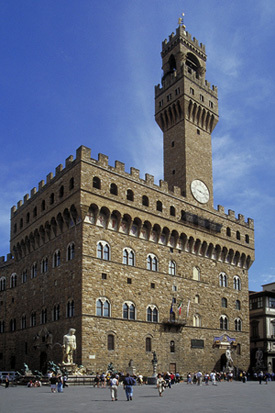 Videos projected on the site’s walls illustrate the history of Palazzo Vecchio and the amphitheater, while visitors can book free tours of the site by contacting info@muse.comune.fi.it. “The project is of great historical significance because it is the only complex of ancient Roman ruins that can be visited in Florence,” the Mayor of Florence, Dario Nardella, told Italy Magazine. Though excavations have been underway for years, the Archaeological Cooperative formally announced the findings at the UNESCO World Forum on Culture and Cultural Industries held in Florence from Oct. 2 to 4, 2014. I found the story to be enlightening and educational. It encouraged me to seek the site and explore it if I can.